Peanut Butter Jelly Time!! Did you know it’s National Peanut Butter and Jelly day? Seems like there is a national holiday for everything these days, but I’m not complaining! We have a peanut allergy at home so we won’t be celebrating in “true” fashion, but with a peanut-free version. Prior to having a peanut allergy this was a favorite! Using the powdered peanut butter cuts down on the amount of saturated fat and calories you would find in regular peanut butter. If you have a peanut allergy, use the same quantity of a peanut-free nut or seed butter. 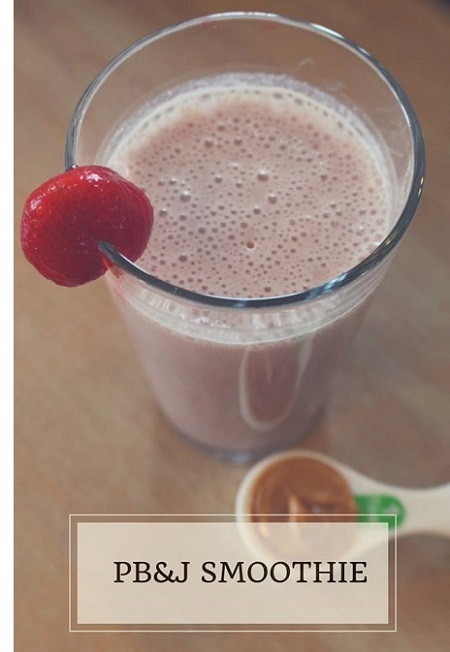 Try this PB&J Smoothie to celebrate National Peanut Butter and Jelly Day!